We finally know just how tall the tallest building in the world is. We’ve also learned that it’s got a new name. 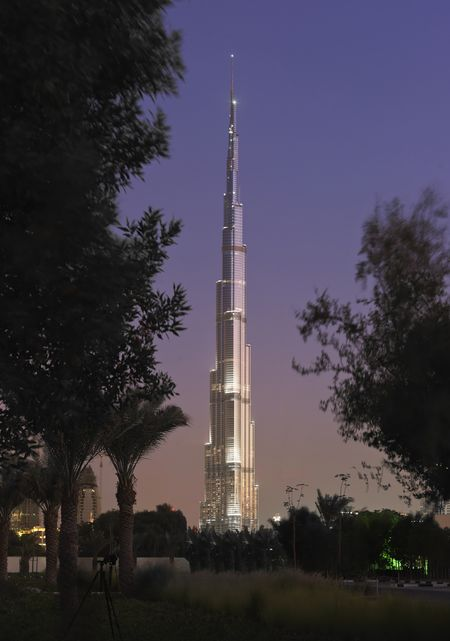 As part of festivities today marking the opening of what had until now been known as the Burj Dubai — Arabic for “Dubai Tower” — officials announced that the skyscraper reaches a full 828 meters, or 2,717 feet, into the sky. That’s nearly 1,000 feet taller than the second-highest man-made structure on the planet, Toronto’s CN Tower. The Dubai tower’s developer, Emaar Properties, had up till now kept the number secret, partially to build up some mystery around its debut. Dubai officials also announced that in something of a surprise they’d decided to rename the skyscraper the Burj Khalifa, in honor of Sheikh Khalifa bin Zayed Al Nahyan, the leader of neighboring Abu Dhabi, the wealthy oil-rich capital of the United Arab Emirates. (The sheikh is also president of the UAE.) It was a curious and perhaps favor-currying choice, since Abu Dhabi has already twice helped rescue Dubai — to the tune of more than $20 billion — as it struggles to renegotiate the debt it piled up during an ambitious expansion over the last decade.